Mozilla last week announced that revenue in 2016 exceeded $500 million, the first time it broke the half-billion-dollar bar, while development costs climbed 6% as the organization worked up Firefox Quantum, the revamped browser it shipped in November. The bulk of the $520 million in revenue for the Mozilla Foundation came from royalty payments, with most of that coming, as usual, from deals struck for the default search engine spot in Firefox. Mozilla Foundation is the nonprofit that in turn runs Mozilla Corp., the commercial organization that creates and services Firefox for Windows, macOS, Linux, iOS and Android. According to Mozilla's just-released financial statement for 2016, $504 million, or 97% of all revenue, came from royalty payments. The percentage of revenue derived from royalties has never dipped below 91% - Mozilla's fortunes have always been tied to Firefox's search contracts - but 2016's portion was lower than the 99% record set in 2015. Search deals composed 94% of the royalty total, Mozilla noted, meaning that the organization brought in $474 million from those agreements. That was about $63 million more than in 2015, a 15% increase. The increase was modest compared to what Mozilla experienced in 2015, largely because 2016 was the second year of the contract with Yahoo that made that search engine the Firefox default in the U.S. and Canada. The deal, inked in late 2014, paid Mozilla $375 million annually, a $100 million-or-so-a-year jump over what the browser maker had been getting from Google for a global contract. But while the Yahoo deal was to be for five years, or until late 2019, the contract gave Mozilla the right to skip out if Yahoo was sold. It was, to Verizon, which this summer completed a $4.5 billion acquisition of the former Internet giant. According to news reports, the new owner was required to pay Mozilla for the full length of the contract, or alternately, just the difference between Yahoo's $375 million and whatever Mozilla got out of a new partner. Last month, Mozilla restored Google as Firefox's default search engine in the U.S. and Canada, and added Hong Kong and Taiwan for good measure. Neither company has revealed the financial terms of the pact. But if Verizon was forced to "buy out" the Yahoo contract, Mozilla's royalty revenues for 2018 and 2019 would likely spike as it adds that money to Google's payments. Mozilla was quick to trumpet the switch in search revenue strategy, pointing out the 24% revenue increase between 2015 and 2016. Most of Mozilla's expenses - 63%, the same percentage as the year before - were spent on software development, which climbed to $226 million, a 6% increase. Overall, expenses increased 7% year-over-year, slightly more than the boost from 2014 to 2015. The difference between that and the much larger increase in revenue meant that Mozilla's "profit" - it tagged the line as "net cash provided by operating activities" - once again jumped, from $80 million the year before to $108 million in 2016. It's impossible to know how much the aggressive work on the Firefox browser in 2016 - which continued into this year as Quantum launched - added to the software development expense line. While it may have ramped up work on the browser, it also shut down its smartphone operating system project, Firefox OS, last year. In early 2017, Mozilla shuttered the remnants of Firefox OS, which had pivoted to an Internet-of-things (IoT) operating system. Those moves, and others, may have reduced spending on non-browser activities even while the browser itself consumed a larger piece of the revenue pie. Mozilla's mounting "profit" - in just two years, it more than quadrupled - and a large rainy-day fund, signaled a solid financial foundation. The best evidence was the total in cash, cash equivalents and investments: That climbed to $399 million in 2016, up $101 million from the year before. With that in the bank, Mozilla could survive at its 2016 expense pace for more than 13 months even if all revenue suddenly vanished. The clouds on Mozilla's horizons weren't mentioned in the financial statement, or the accompanying tax return. Nor were they new. Firefox's share of the desktop browser market, the only space in which it is legitimately competitive, are again showing troubling signs. Although Firefox's user share, an estimate generated by analytics vendor Net Applications, hasn't collapsed, as happened in mid-2016, the trend has been ugly. In new data from Net Applications, which the California company produced after scrubbing as much "bot" traffic as possible, Firefox posted a November 2017 share of 11.4%; that represents a downturn of 23% since the same month of the year before. No other browser slumped that dramatically. Other sources showed a major Firefox fall-off, too. 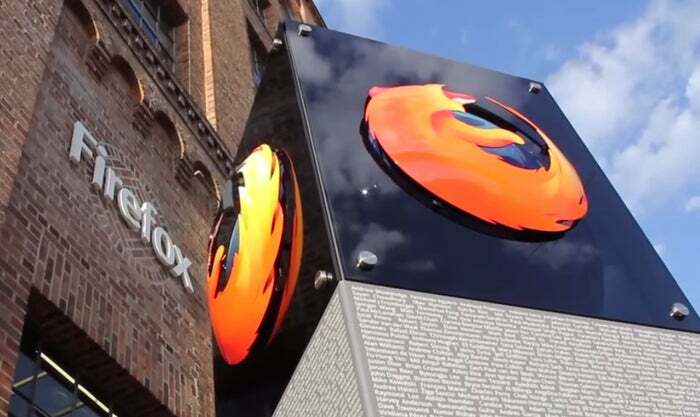 Irish metrics company StatCounter, for instance, reported a 16% year-over-year decline in Firefox's usage share, a measurement of browser activity. Firefox's global share in StatCounter's November estimate was 12.6%. Share is important to all browsers because the applications are revenue generators for their owners. Firefox's interest in share is especially keen, simply because other major makers have additional revenue streams; the search contracts Mozilla held in 2016 produced 91% of the organization's total revenue. If the browser continues to shed users, search firms such as Google will have less reason to pay Mozilla for the privilege of getting the default in Firefox. That's always been Mozilla's Achilles heel, the reason it explored alternate means of making money - including in-browser ads that were in the end abandoned. And the share problem certainly was motivation for revamping Firefox last year and this, as developers added multi-process support - long a standard for Chrome - and then began replacing and upgrading key components such as the rendering engine, and overhauled the user interface (UI) to resemble Chrome and other putative rivals, like Microsoft's Edge. It's too early to know what impact, if any, Firefox Quantum will have on Mozilla's share of the browser market. But the financial side of the equation looks rosier than ever, a strong sign that the open-source developer will continue to compete with its much bigger rivals. 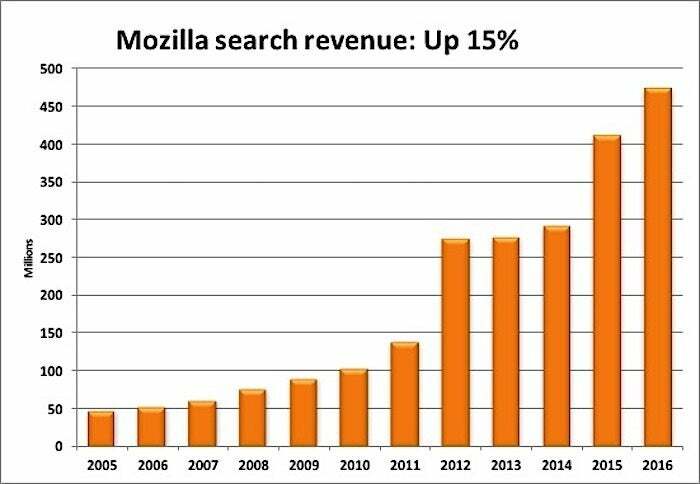 Mozilla's revenue from all search contracts climbed to $474 million in 2016. The bulk of the revenue jump came from the deal Mozilla struck in 2015 with Yahoo. But when Yahoo was sold to Verizon, Mozilla dropped the deal and signed instead with Google.